What a special weekend. After getting waxed in Chapel Hill the night of March 5th, I know I was chomping at the bit to get a rematch with North Carolina in the conference title game. As much as the team wanted to win another conference tournament, I’m sure they also wanted to do so at the expense of our hated rivals. So I was quite pleased that the Tar Heels overcame deficits of 19 and 14 points todefeat Miami and Clemson, respectively. Kyle Singler carried the team on Friday against Maryland with 29 points,while Nolan Smith recovered quickly from the toe knock he suffered againstMaryland to score 27 points against Virginia Tech on Saturday. On Sunday, Duke probably put together its best 40 minutes of the year, as it dominated North Carolina. 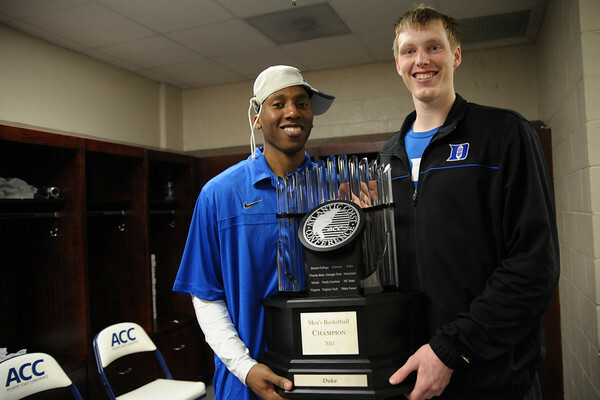 Everyone contributed to the 75-58 victory that gave Duke the third chapter of the 2011 rivalry. In the final minute of the game, ESPN’s Dan Shulman cited a comforting statistic: outside of Smith and Singler, the rest of the team shot 18-for-25. I’d have never believed we could beat Carolina by 17 and yet have our two best players score 31 points on 32 shots. That shows how outstanding the supporting cast was yesterday. Miles Plumlee was great all weekend, crashing the glass hard and grabbing offensive rebounds. In fact, he’s played well the last four games, as he was the only big to show up in Chapel Hill. Let’s not forget offensive rebounding was critical to our success last year. Ryan Kelly definitely bounced back from his horrendous showing last week to average 9.7 points on 66.7% shooting in the Tournament. Most importantly,though, we had an Andre Dawkins sighting this weekend. Much has been made ofhis gradual decline throughout the season, but it was good seeing him get after it on defense all weekend. All these are encouraging signs. If the supporting cast plays that well in the NCAA tournament—and that’s a big if—we can all book our tickets to Houston now. Ohio State, Kansas, Pittsburgh and Duke are the number 1 seeds for the NCAA tournament. Duke probably has the toughest road to the Final Four among the 1 seeds. Michigan and Tennessee are no slouches as second-round opponents, but I am really intrigued by the potential Sweet 16 matchup in Anaheim. Texas,which has slumped to a 4 seed, was in the conversation for a 1 seed only two weeksago. Arizona as a 5 seed, has the best big man in the country in Derrick Williams,who will play a big role if there is going to be a 2001 national championship rematch. On the other side of the West region, San Diego State will essentially play two home games should they reach the Sweet 16. This region is also loaded in star player Kemba Walker and the Connecticut Huskies lurk as the 3 seed. Another Duke-UConn game in the Elite Eight would be quite the treat for college basketball fans. Can George Mason be this year’s Northern Iowa and knock out the overall number 1 seed in the second round? They have a coach with Final Four experience but they’ll first have to get by a Villanova team that was once in the top 10 of the polls. The new “First Four” games should be very interesting, at least on the at-large side. Clemson and UAB will square off for the chance to play West Virginia, and USC and VCU will square off for the chance to play Georgetown. I like Clemson and USC to win those games. UAB and VCU should not even be in the field (1 top-50 win combined), considering a team like Colorado, who beat Kansas State three times and Texas as well, was left out. More bracket analysis is forthcoming from C-T. With Team Crazie-Talk now assembled, we’re stoked to start making picks based on reason, and being completely disappointed in the outcomes.